Furnished villa in luxurious complex. Set among olive groves and with sweeping views of the mountains and the sea, this villa is ideal for lazy, sun-drenched holidays. Spacious and tastefully furnished, it is well suited to modern living with convenient appliances and a modern kitchen. Two bedrooms have huge built in wardrobes as well as air-conditioning and there are two bathrooms. Walk to the local baker to buy fresh bread, laze in the sun on one of the two patios, or at the large pool. After a restful siesta, enjoy a barbecue at home or go to any of the nearby restaurants for delicious home-cooked Greek fare. Pubs and children's entertainment such as a petting zoo, putt-course and football field are also nearby. This is a holiday destination that the whole family can enjoy! Beach towels are available for guest use. Property as described. Clean and plenty of equipment, towels etc. Did not affect us but no description of where swimming pool is in relation to the villa. 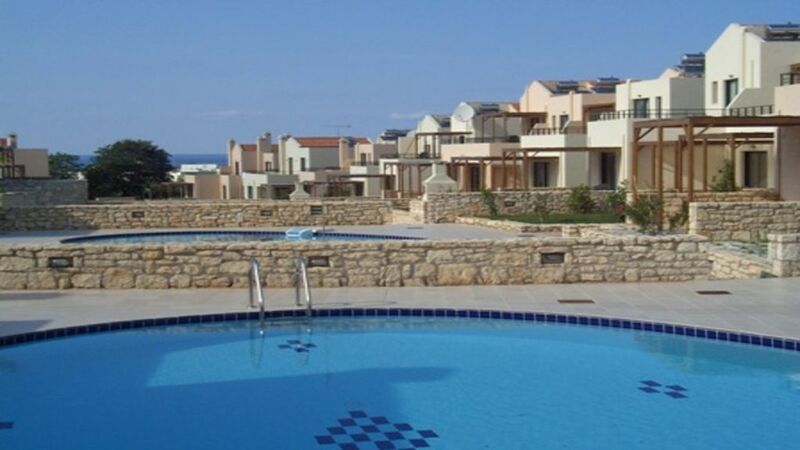 Could affect families with children who think that they can keep an eye on them from the villa because of picture showing all the pools in the main part of the complex. Had a really relaxing week and would recommend it to others. A must for all hiking enthusiasts is the Samara Gorge hike which is situated in the Chania region. There are tours available where transport to the gorge is arranged from Georgioupolis as well as a well deserved dip in the Mediterranean after the 16km hike and return transport.